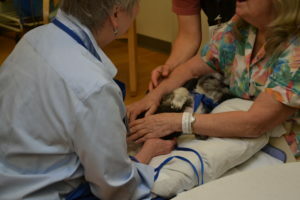 Many hospital staff members (administrators as well as direct-care staff) are interested in taking advantage of the human-animal bond – the relationship between people and animals – to assist their patients. 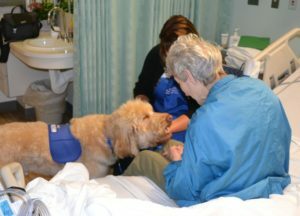 One way of doing this is to offer visits from therapy dogs or other therapy animals. This is called animal-assisted interactions (AAI). These interactions come in the form of activities and/or therapy on the menu of healing options offered to patients. The presence of trained and screened therapy animals in therapy sessions can have a powerful, positive effect on people with an affinity for animals. Imagine someone who loves dogs and who has been hospitalized after a stroke. This person works on physical therapy, occupational therapy, or speech therapy exercises with average motivation. Now imagine bringing in a dog and asking the person to do the same therapy exercises, but with one major difference: the patient gets to work with the dog instead of the therapist’s cones or blocks or puzzle pieces. Can you see what a difference it can make if the goal is to reach out to pet a dog rather than reaching out to pick up a wooden block for that person? IF the animal-handler teams are trained and screened. IF the patient is not fearful or allergic. 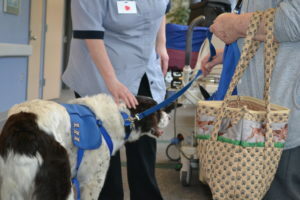 IF the handler knows how to work both with the animal and with the patient. IF the facility staff know what to do to keep people safe. As you can see, it is not as effortless as simply allowing in a therapy dog. In order to be successful and safe for all involved (including the animal), lots of people need to know what they’re doing. As a result, not all staff have confidence that they can adequately address risk management. Areas like infection control, injury, fleas, animals acting badly, and allergies make them shudder – as well they should! Human-health and -services organizations today often struggle to make ends meet for essential services, and animals don’t seem essential. Is there a way to make ends meet and include animals? Yes! Human-Animal Solutions knows how. We provide cost-effective consultation about all areas of developing a new or enhancing an existing therapy animal program. To assure quality and protect the consumer, therapy animal programs must be standards- and competency-based. Ann Howie was part of the team of subject-matter experts who developed Standards of Practice in Animal-Assisted Activities & Therapy in 1989, and she developed the first competency-based professional education program for human-services providers (through the University of Denver) in 2017. We are highly conversant in standards and competencies. We can help you avoid common pitfalls, and thus enhance staff, volunteer, and patient satisfaction – and save money. Do your current practices reduce risk and satisfy infection control? Human-Animal Solutions is familiar with facility needs in written policies and the primary issues that must be addressed in animal-related policies. We help you develop complete, standards-based policies and competency-based practices before therapy animals are introduced. Do you know how your facility’s environment, dynamics, staff, and patients/clients will affect the provision of AAI? We so! We will tour your facility and meet with key staff members to provide a standards-based feasibility study for your facility. You will receive a detailed written report that includes individualized strengths and barriers, options, and a plan of action. 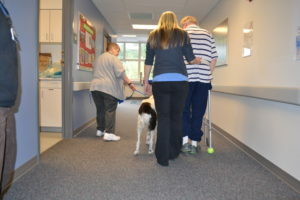 Do you know how to receive insurance reimbursement for animal-assisted therapy? Staff we train do! 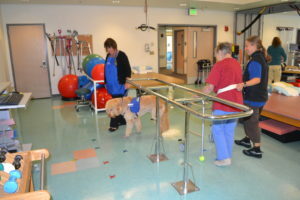 Staff learn how to work effectively with therapy animals in the professional environment: identify patients/clients who are appropriate for AAI, work effectively with the AAI provider, write AAT into treatment plans, and more. You will be assured that the volunteers entering your program are suitable and qualified to meet your needs. We help you obtain high marks on your facility’s animal program in Joint Commission, CARF, and local government surveys. If you don’t find your issues in the above list, contact us for additional information. 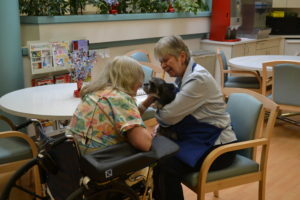 Long-term-care facilities have many education needs associated with augmenting their human habitat with animals. Whereas an essential principle in the Eden philosophy is to utilize the experience of staff and residents, sometimes specialized expertise is needed to augment the resources you have on site. We can help you avoid expensive mistakes in animal choice and common pitfalls in incorporating animals into your habitat. Principle 2 – Surrender the institutional point of view and adopt the human habitat model. We help staff and residents prepare the soil by developing standards-based policies and practices before animals are introduced. Principle 4 – Provide daily opportunities to give as well as receive care. Residential animals require care plans just as do human residents. We help your Animal Committee develop realistic, humane, and thorough animal care plans that can be easily maintained by staff and residents for all animal species. Principle 6 – De-emphasize the programmed activities approach. Staff prepared by Human-Animal Solutions know how to fertilize the soil by writing animal interactions into residents’ care plans, encouraging day-to-day interactions between animals and residents, and trouble-shooting potential animal illnesses or behavior problems. 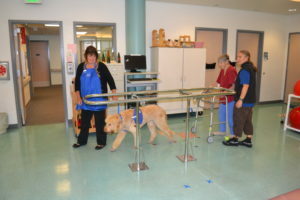 Our skilled, compassionate professionals offer you the best in training and consultation for therapy animal programs. If you don’t find your issues in the above list, contact us for additional information.